Background & objectives: Leishmaniasis is a growing health problem in many parts of the world. Efforts to find new chemotherapeutics for leishmaniasis remain a priority. This study was carried out to determine the effect of combination and monotherapies using plant extracts and herbicides on Leishmania major infection in BALB/c mice. Methods: The herbicides and saponin extract were purchased from Sigma. Roots of Plumbago capensis were collected from Karura forest, Nairobi, Kenya. Plant extractions were done in KEMRI at Center for Traditional Medicines and Drugs Research. Results: Lesion sizes after infection of BALB/c mice were similar in all the experimental groups till the onset of therapeutic treatments (p >0.05). At 15 days post-treatment, significant differences (p < 0.05) were discerned in the lesion sizes of the BALB/c mice in all the mono- and combined-treated groups. However, the combined therapies caused total elimination of the parasites from the lesions and significantly reduced parasite burden in liver and spleen compared to the untreated controls at the end of the experiment. Interpretation & conclusion: The results of this study demonstrate that combination therapy using alternative administration of saponin, acriflavine, trifluralin and plumbagin is effective in treating L. major infection in mice. In this regard, an investigation into the efficacy of these combined therapies against other Leishmania strains should be explored further. Furthermore, studies with these combination therapies should be done on non-human primates such as the vervet monkey (Cercopithecus aethiops). Background & objectives: The artemisinin-based antimalarial medicines are first line medicines in the treatment of severe and uncomplicated falciparum malaria. Numerous brands of these medicines manufactured in various countries are available in the Ghanaian market. The study was aimed at evaluating the authenticity and quality of selected brands of artemisinin-based antimalarial medicines marketed in Ghana. Methods: In all, 14 artemisinin-based antimalarial medicines were purchased from pharmacies (P) and licensed chemical shops (LCSs) in the Kumasi metropolis, Ghana. Simple field tests based on colorimetry and thin layer chromatography were employed in determining the authenticity of the samples. Important quality assessment tests, namely uniformity of mass, crushing strength, disintegration time, and the percentage content of active pharmaceutical ingredients (APIs) were determined. Results: All the brands tested contained the stipulated APIs. Artesunate tablet AT2 failed the uniformity of mass test while artesunate tablets AT3 & AT4 as well as amodiaquine tablets AM4 & AM6 failed the crushing strength test. All the six artemether-lumefantrine tablet brands passed the uniformity of mass, crushing strength and disintegration tests. Only artemether-lumefantrine tablet brand AL1 contained the correct amount of the drugs. The other 13 artemisinin products contained either a lower (underdose) or higher (overdose) amount of the specified drug. Artesunate monotherapy tablets were readily available in pharmacies and licensed chemical shops. Interpretation & conclusion: All the artemisinin-based medicines tested (except AL1) were of substandard quality. The results demonstrate the need for continuous monitoring and evaluation of the quality of artemisininbased antimalarials in the Ghanaian market. Also, the practice of artemisinin antimalarial monotherapy is prevalent in Ghana. Determined efforts should, therefore, be made to eradicate the practice to prevent the development of resistance to the artemisinins. Background: The biting preference of Simulium vectors has been known to influence the distribution of Onchocerca nodules and microfilariae in human body. There is, however, variation in biting pattern of Simulium flies in different geographical locations. This study investigates the biting pattern on human parts by Simulium vectors along Osun river system where Simulium soubrense Beffa form has been implicated as the dominant vector and its possible implication on the distribution of Onchocerca nodules on human body along the river. Methods: Flies were collected by consented fly capturers on exposed human parts namely head/neck region, arms, upper limb and lower limb in Osun Eleja and Osun Budepo along Osun river in the wet season (August–September) and the dry season (November–December) in 2008. The residents of the communities were also screened for palpable Onchocerca nodules. Results: The results showed that number of flies collected below the ankle region was significantly higher than the number collected on other exposed parts (p <0.05) while the least was collected on head/neck region in both seasons. The lower trunk was the most common site (60%) for nodule location at Osun Eleja followed by upper trunk (40%). Nodules were not found in the head and limb regions. At Osun Budepo, the upper trunk was the most common site of the nodule location (53.8%) followed by the lower trunk (38.5%) and head region (7.7%). Conclusion: Though, most of the flies were caught at the ankle region, the biting of other parts coupled with the presence of nodules at the head and upper trunk regions showed that Simulium vectors could obtain microfilariae from any part of the body, thus increasing the risk of onchocerciasis transmission. Background & objectives: Human and livestock African trypanosomiasis, otherwise known as sleeping sickness, is a neglected tropical disease of public health importance in west and central Africa. In view of the adverse side effects of the antitrypanosomal drugs, the relatively few side effects observed in ivermectin use, and because both onchocerciasis and typanosomiasis occur in overlapping foci in Africa, it would be desirable if the ivermectin that has been used successfully on onchocerciasis management could also be used in the control and treatment of trypanosomiasis. Method: In this study, prophylactic and therapeutic effects of ivermectin (Mectizan) were investigated in albino mice infected with a Nigerian strain of Trypanosoma brucei brucei. Results: A 300 μg/ml/kg dose had the most effective impact because it showed the highest mean survival time of 12 days in both the treatment and prophylactic groups of mice. This dose also enhanced the defence capacity of the treated groups. It also had positive influence on the packed cell volume (PCV) and the state of anaemia in the trypanosome infected mice, hence, improving their survivability. Interpretation & conclusions: Our report indicates that using the 300 μg/ml/kg dose of ivermectin increases the mean survival period from 5 to 12 days. This suggests that ivermectin could be possibly used in the treatment of trypanosomiasis. Further studies will be required to show whether proper treatment may entail a single dose, as used in this study; an increased number of doses, or combinations with other drugs. Background & objectives: The challenge of malaria and efforts targeted at developing malaria vaccines triggered this study on the reactivity of IgG and its subclasses in the test serum specific to CSP. This work was directed at assessing the influence of age and gender on host humoral antibody against Plasmodium falciparum recombinant circumsporozoite antigen in Nigerian children. Methods: In all, 67 serum samples (>10,000 parasites/μl of blood) collected from malaria-infected children at the University College Hospital, Ibadan during the transmission season were analyzed by ELISA. Results: The mean absorbance values of IgG subclasses reactive against P. falciparum CSP appeared to be agedependent and ranged from 0.01 for IgG4 in younger children to 0.95 for IgG3 in older children. The sixty-seven subjects investigated in this study had significantly higher mean IgG1 and IgG3 than the uninfected controls (p <0.01). This follows the order IgG3 >IgG1>IgG2>IgG4 which confirmed the prevalence of the cytophilic antibodies (IgG1 and IgG3) in 65% of the malaria infected children over the non-cytophilic subclasses (IgG2 and IgG4). Similarly, there was low production of IgG4 and IgG2 levels in 35% of the subjects compared with control. IgG was detected in the serum of North American Subjects (NAS) which served as negative control for CSP-specific IgG subclasses. Although the NAS titre was lower than that of the malaria subjects in Nigeria, its IgG2 was, however, higher (0.16) than that of other subclasses. The mean absorbance values of total serum IgG subclass were higher than those of IgG subclasses specific to P. falciparum circumsporozoite antigen. The mean absorbance values of the total serum IgG subclass follows the order IgG2>IgG1>IgG4>IgG3. Interpretation & conclusion: Age and gender-dependent correlations of results suggest that acquired immunity could play a significant role in protection from malaria. Antibody levels are higher in male than female children of the same age group. Antibody levels also increase with age in both the male and female children. Background & objectives: The proportion of malaria cases that are complicated and fatal are not well described in India. Alipurduar sub-division of Jalpaiguri district in West Bengal is highly endemic for malaria. We constructed a retrospective cohort of severe malaria patients admitted in the secondary and tertiary care facilities in Alipurduar to determine the incidence, assess the management, and evaluate the reporting of severe and fatal malaria. Methods: We reviewed routine surveillance data and the case records of all the malaria patients admitted in all secondary and tertiary care facilities, both public and private. We defined severe malaria cases as Plasmodium falciparum infection with clinical signs and symptoms of organ involvement in a resident of Alipurduar admitted during January to December 2009. We compared clinical and demographic characteristics of severe malaria cases that died with those who survived. We also reviewed human resources and laboratory facilities available for the treatment of severe malaria in these health facilities. Results: During 2009, 6191 cases of P. falciparum in Alipurduar were reported to the malaria surveillance system. We identified 336 (5.4%) cases of severe malaria among which 33 (9.8%) patients died. Four malaria deaths were also recorded from primary health centres. Only 17 of the 37 (46%) total deaths recorded were reported to the routine surveillance system. Most severe cases were males (65%), aged >15 years (72%), and nearly half were admitted to secondary care hospitals (48%). In multivariate analysis, the risk factors associated with death included increased delay fever onset and hospitalization, treatment in a secondary level hospital, younger age, and multi-organ involvement. The secondary level public hospital had too few physicians and nurses for supporting severe malaria patients as well as inadequate laboratory facilities for monitoring such patients. Conclusions: Severe and fatal malaria continue to burden Alipurduar and record keeping in health facilities was poor. Many malaria deaths were not routinely reported even in the public sector. Improved surveillance and increased human and laboratory resources are needed to reduce malaria mortality. Background & objectives: Correct vector identification is an important task in the planning and implementation of malaria vector control programmes. 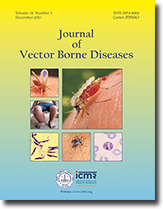 This study was designed to provide baseline information on the species composition and distribution of members of the Anopheles gambiae complex in three eco-vegetational zones in Bayelsa state, Nigeria. Methods: Adult mosquitoes were collected by pyrethrum spray catch (PSC) in randomly selected houses during September 2009–August 2010. Anopheles mosquitoes were identified using standard morphological keys. Mosquitoes identified as An. gambiae s.l. were used for species specific PCR-assays. Results: Out of 203 Anopheles gambiae s.l. successfully amplified, 180 (88.7%) were Anopheles gambiae s.s., 14 (6.9%) were An. melas and 9 (4.4%) were An. arabiensis. The variation in the sibling species composition of An. gambiae s.l. was not significant (p >0.05). Anopheles gambiae s.s. was predominant in all the collections with three sibling species occurring in all the eco-vegetational zones. Interpretation & conclusion: The observation of An. melas in the fresh water swamp forest of Yenagoa is of importance in malaria epidemiology. These findings are of importance in the planning and implementation of malaria vector control strategy in the three eco-vegetational zones of Bayelsa state. Background & objectives: Leishmaniasis is a geographically widespread severe disease which includes visceral leishmaniasis (VL) and cutaneous leishmaniasis (CL). There are 350 million people at risk in over 80 countries. In the Old World, CL is usually caused by Leishmania major, L. tropica, and L. aetiopica complex of which 90% of cases occur in Afghanistan, Algeria, Iran, Iraq, Saudi Arabia, Syria, Brazil and Peru. Recently, Eslami et al (2011) reported a novel TRYP6 gene encoding tryparedoxin peroxidase from an Iranian L. major strain exhibiting homology with the related gene in a divergent genus of Kinetoplastida, the Crithidia. This prompted us to analyze the mentioned gene in 100 isolates obtained from patients with suspected CL. Consequently, we analyzed internal transcribed spacer 1 (ITS1) region, RNA polymerase II largest subunit (RPOIILS) and the mitochondrial DNA polymerase beta (DPOLB). Methods: After obtaining samples from 100 patients, DNA extraction was performed and TRYP6 was analyzed using conventional PCR. All samples harbouring TRYP6 with smaller size (555 bp) were analysed based on three other regions: ITS1, RPOIILS and DPOLB genes. Results: Results showed that 10% of the isolates have the same character as observed in our previous study. The ITS1-RFLP-PCR of this 10% isolates showed their similarity to the one from Crithidia fasciculata. RNA polymerase II largest subunit (RPOIILS) showed genetic diversity but the mitochondrial DNA polymerase beta (DPOLB) did not show any genetic diversity. Conclusion: This study might also help in solving the problems concerning Leishmaniasis outbreaks currently reported in Iran and some other endemic regions of the world. Background & objectives: In the present study, an attempt was made to find reasons of ineffectiveness of indoor residual spray to interrupt malaria transmission by investigating the behaviour of two variants of Anopheles stepnesi, viz. type form and mysorensis in rural areas of Rajasthan, India. Methods: Both low malarious (DDT spray from 1958 to 1976) and high malarious (DDT spray from 1958 to April 2006) villages were selected for the study in Arid zone district Jodhpur, Rajasthan during March–April 2006. Resting behaviour of the species during all its movement rhythms covering 24 h period related to: (i) swarming/mating; (ii) pre- and post-biting rest; (iii) after feed resting between hoping movements; (iv) night and day time resting and; (v) diel activity movements in response to temperature changes, were carried out. Results: The results showed that household objects like cupboards, furnitures, hanging clothes, goods stacked on loft, stored clothes, cobwebs and floor were the dominant resting sites both in sprayed and unsprayed villages. About 95 and 97% of An. stephensi preferred to rest on household objects of unsprayed and sprayed villages respectively. There was no significant difference in resting behaviour of the species in both groups of villages (p >0.05). The pre-biting resting time was recorded as 5 to 15 min whereas post-biting resting time lasted for 15 to 25 min. After biting outdoor (in courtyard – open to sky) species starts entering the rooms at around 2330 hrs. It was observed that during III quarter (0100 to 0400 hrs) maximum species entered into the room were 56% in unsprayed and 62% in sprayed villages. Statistically there was no significant difference in the entry of mosquitoes (p >0.05) in both the groups of villages. Conclusion: Before DDT era, An. stephensi was found resting at all heights of the walls inside the human dwellings. Present study revealed that An. stephensi is trying to avoid sprayable surfaces and tend to rest on unsprayable surfaces during all its movement rhythms starting from swarming, pre-/post-biting and during hopping movements in the courtyard and thereafter household objects inside the room as final day time resting. It was concluded that changed behaviour of resting of An. stephensi on unsprayable objects in sprayed rooms largely accounted for failure of malaria control. Control of An. stephensi, thus requires an integrated vector control strategy based upon interesectoral, environmental, larviciding with chemical/biolarvicide and use of larvivorous fish wherever feasible. Such a control strategy offers cost-effective and sustainable option than indoor residual spray. Background & objectives: In the present study, Icon®Life net, a long-lasting polyethylene net, 100 denier and bursting strength of minimum 280 kpa incorporated with deltamethrin @ 65 mg/m2 was evaluated for its efficacy in reducing the density of malaria vector Anopheles culicifacies and impact on malaria prevalence in a malaria endemic area of District Gautam Budh Nagar, India. Methods: Wash resistance of Icon® Life LLIN was determined up to 20 serial washings using An. culicifacies in cone bioassays under field conditions. Efficacy of Icon®Life LLIN was determined in the field in three sets of villages in District Gautam Budh Nagar (Uttar Pradesh), India, selected randomly for the intervention with Icon®Life LLIN, untreated nets and a control without any intervention for the period of August 2008–July 2009. Entomological and malariometric indices in all the three villages were compared during pre- and post-intervention periods for one year against An. culicifacies. A survey was also conducted in the village provided with Icon® Life LLIN to assessing the perception of community regarding acceptance of these nets by the community. Results: In cone bioassays on Icon®Life LLIN with An. culicifacies, >95% knockdown within 1 h and 100% mortality after 24 h exposure were reported even after 20× serial washings under field conditions. Results of the field study revealed reduced entry rate, resting density and parity rate of An. culicifacies in the village with Icon®Life LLIN when compared to no net and untreated net villages. Number of malaria cases reported were less in the Icon®Life LLIN used villages when compared to other two villages. The community compliance and acceptance was high and no adverse health events were reported by the households using these nets. Conclusions: Icon® Life LLIN is an effective intervention for the control of An. culicifacies transmitted malaria in India. Long-term studies are indicated for the duration of effectiveness and to ascertain the epidemiological impact of the use of Icon® Life nets.